Glorietta has expanded once again. Well you may very well know that Glorietta is a relatively "old" mall compared to the newer ones sprouting out the metropolis. 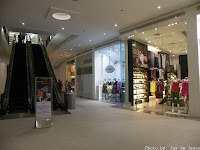 And Glorietta 2 was severly damaged when a bomb exploded. 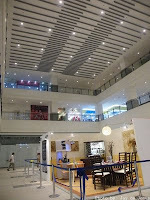 So now, behold, Glorietta 5. The site where Glorietta 5 is situated used to be an open-air parking lot. 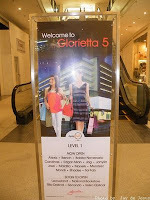 Glorietta 5 is located between Hotel Intercontinental and Rustans. 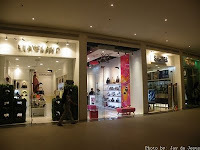 It's also beside the Glorietta park across Glorietta 4 and the former Oakwood Hotel. Unlike Glorietta 1 to 4 all interconnected and joined by its center, Glorietta 5 is only joined to Glorietta 4 by its underground parking lot. This new Glorietta wing is classy and brings a new ambiance to the Glorietta malls with its sophisticated shops and design. There aren't much stores open yet and the place is still currently being built after mall hours. Expect the scent of fresh paint for the meantime. One of the biggest stores to move here is National Bookstore. 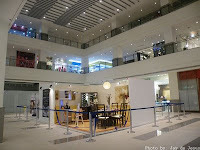 It moved from its former location at Glorietta 1 but retains its two-floor structure in the new Glorietta wing. I agree. It's like they're rushing the opening and not waiting for it to be finished. That's why they opened the mall half-done and working on it while open (and when closed). Hope they finish it right away.